Not to be confused with Wrangell or Wrangell Island, farther southeast in Alaska. The Wrangell Mountains are a high mountain range of eastern Alaska in the United States. Much of the range is included in Wrangell-Saint Elias National Park and Preserve. The Wrangell Mountains are almost entirely volcanic in origin, and they include the second and third highest volcanoes in the United States, Mount Blackburn and Mount Sanford. The range takes its name from Mount Wrangell, which is one of the largest andesite shield volcanoes in the world, and also the only presently active volcano in the range. 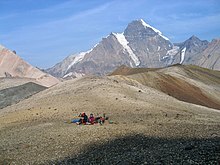 The Wrangell Mountains comprise most of the Wrangell Volcanic Field, which also extends into the neighboring Saint Elias Mountains and the Yukon Territory in Canada. The Wrangell Mountains are just to the northwest of the Saint Elias Mountains and northeast of the Chugach Mountains, which are along the coast of the Gulf of Alaska. These ranges have the combined effect of blocking the inland areas from warmer moist air over the Pacific Ocean. The inland areas to the north of the Wrangell Mountains are therefore among the coldest areas of North America during the winter. The mountains are named after explorer, president of Russian-American Company, and admiral Ferdinand von Wrangel. American folk singer John Denver wrote a song, "The Wrangell Mountain Song", in reference to the range. ^ "Mount Blackburn, Alaska". Peakbagger.com. Retrieved December 30, 2015. Richter, Donald H.; Danny S. Rosenkrans; Margaret J. Steigerwald (1995). Guide to the Volcanoes of the Western Wrangell Mountains, Alaska. USGS Bulletin 2072. Winkler, Gary R. (2000). A Geologic Guide to Wrangell—Saint Elias National Park and Preserve, Alaska: A Tectonic Collage of Northbound Terranes. USGS Professional Paper 1616. ISBN 0-607-92676-7. Richter, Donald H.; Cindi C. Preller; Keith A. Labay; Nora B. Shew (2006). 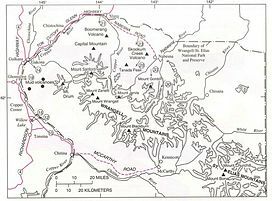 Geologic Map of the Wrangell-Saint Elias National Park and Preserve, Alaska. USGS Scientific Investigations Map 2877. Wikimedia Commons has media related to Wrangell Mountains.